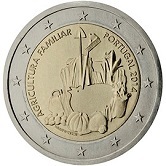 Portugal was one of the founding members of the Euro zone and started minting coins in 2002. Some basic facts relating to Portugal. 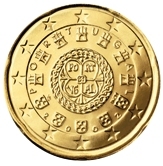 The theme of all the Portuguese Euro Coins consists of fascinating royal seals of the past. Three seals were selected, from the years 1134, 1142 and 1144. 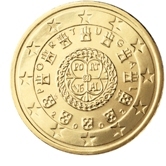 Each seal is depicted on one of the coin series. 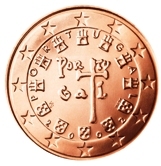 First series (the "copper-coloured coins") 1 cent, 2 cent and 5 cent - 1134 seal. 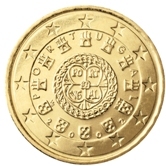 Second series(the "gold-coloured coins")10 cent,20 cent and 50 cent-1142 seal. 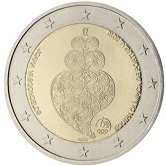 Third series the one and two Euro coins - 1144 seal. Motif for the first series - the cross of Knight Templar with "Portugal". Above the cross is a semi -circle consisting of seven castle towers. Between each of the towers is a letter of Portugal. Below the cross is a semi-circle consisting of five shields. 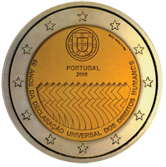 Motif for the second series - Rota and cross with "Portugal" as well as two semi-circles as described for the 1st series. 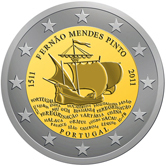 Motif for the third series - Compass rose with "Portugal" as well as two semi-circles as described for the first series. 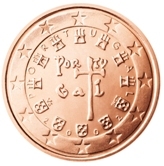 1 cent- Cross of the Knights Templar. 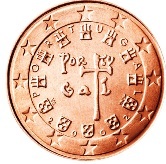 2 cent- Cross of the Knights Templar. 5 cent- Cross of the Knights Templar. 10 cent- Rota with Cross. 20 cent- Rota with Cross. 50 cent- Rota with Cross. 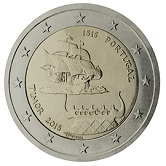 1 Euro - Compass Rose. 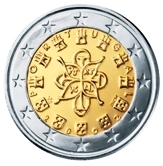 On the rim of the Two Euro Coin are seven castle towers as in the 1,2 and 5 cent coins followed by five coats of arms - the latter look somewhat like elongated "Ds". 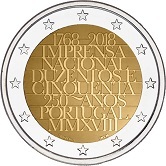 Portuguese Commemorative Two Euro Coins. 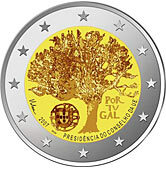 2007 - The coin commemorates Portugal's presidency of the European Union. 2008 - 60th anniversary of the declaration of human rights. 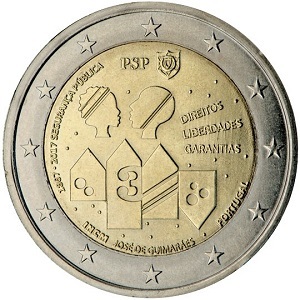 2009 - Commemorates the Losofonia Games of 2009. 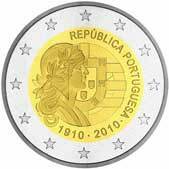 2010 - Commemorates the 100th anniversary of the Portuguese Republic. 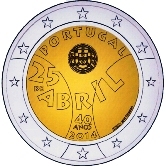 2011 - 500th birthday of Fernao Mendes Pinto. 2012 - Guimaraes European Cultural Capital for 2012. 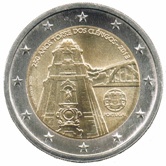 2013 - 250th Anniversary of the Torre dos Clérigos in Porto.The 76 m high tower once served as an orientation for seafares. 2014 - 40th Anniversary of the "Carnation Revolution" That ended dictatorship and established democracy in Portugal. 2014 - The International Year of Family Farming. 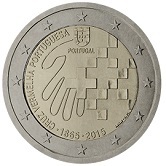 2016 - Portugal's Participationin the 2016 Olympic Games. 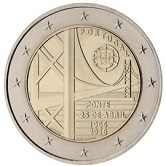 2016 - 50th Anniversary of the opening of the Bridge over the river Tejo. 2018 -250th Anniversary of the National Printing House. 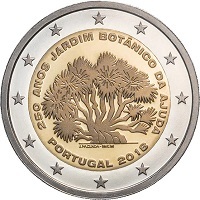 2018 -250th Anniversary of the Botanical Gardens at Ajuda. 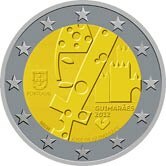 Return from Portuguese Euro Coins to Links to Specific Countries. 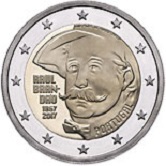 Return from Portuguese Euro Coins to euro coin collector.